Our soy isoflavone product is obtained using an extract of fermented soya beans and provides 50mg of bioavailable phytoestrogenic soy isoflavones per day. This unique formulation also contains magnesium (known to help with symptoms such as tiredness and fatigue), hibiscus and vervain. Each tablet of Menopause Support contains 42mg of fermented soya bean extract, containing 25mg of isoflavones including 11.5mg are genistein, 11.5mg daidzein and 2mg glycitein. The product vendor, located in the UK, offers a product return and refund policy as well as a customer support contact number. The product source also included a number of favorable customer testimonials. 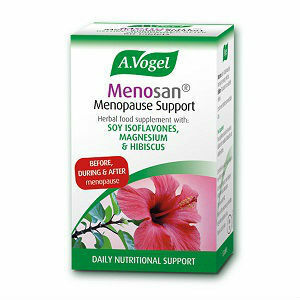 The vendor claims that a unique combination of ingredients make this product work to help relieve menopause symptoms while containing largely natural ingredients. While the product is moderately priced compared to similar products and product reviews on the vendor’s website are good it would probable be a good idea to have a health service professional review this product prior to purchase. Jackie Horowitz	reviewed A. Vogel Menosan	on March 1st	 and gave it a rating of 2.5.